Would you like to see your windows look pristine without wasting time, energy and a great deal of cash? 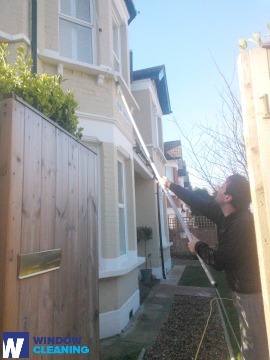 You can succeed in this now – just let the professionals of window cleaning in Moorgate deal with this chore for you. We will make sure that all parts of your windows are in squeaky clean state – glass surfaces, frames and window sills. You can be certain that your property is managed with great care. Go and use your time for leisure more essential. tasks this is not all – the But to will come to you escape chores with alongside numerous. We also provide our professional services in nearby areas: Cheapside, Bishopsgate, London Wall, Liverpool Street, Broadgate. We use the most advanced methods to be sure that you receive highest quality window cleaning. With our water-fed extension pole cleaning system and high pressure cleaning technique, you will enjoy perfectly clear look of your glass surfaces. We connect our poles to water supply devices in our vans to ensure that there is no risk for the exterior of your dwelling or business premise. For higher windows, we use entirely secured rope access approach. You can profit from these cleaning techniques now – just dial 020 3746 3113! You can depend on the cleaners for both private and commercial window cleaning. All kinds of glass surfaces are included in our professional practice. For instance, you can request a service for cleaning small or double windows, French doors, sash windows, patio doors and bay windows. Besides these, we wash and polish garden window surfaces, greenhouses and roof glass. At home or at the office, you can always ensure crystal clear glass – just call us! We have what it takes and the right techniques for the assignment. Improve the look of your building – the specialists of commercial window cleaning will see to that. As part of our exceptional method, we use water-fed extension poles. With this approach, we can clean completely the windows from outside of your business premise, as high as the fourth floor. In order to reach highly-rised windows we use rope access. We make sure your windows will look pristine, no matter the high of the building. With the assistance of the squad of experts London's skyline will never be dirty. Hire us for window cleaning in Moorgate for your home. We will use mentioner earlier techniques – water fed extension pole system for easy-to-reach windows and rope access tools for higher ones. For the entire service we use purified water. Request a service today – call 020 3746 3113 and speak with our representatives. Or you can fill in our online booking form or use our chat option. The nearest tube station serving EC2 Moorgate is Old Street.